Blame it on the weather – we seem to have re-entered Pennsylvania’s carboniferous period, the Paleozoic era of tropical rain forests that produced those rich fields of coal, oil, and natural gas that are so currently in contention. Daily rainstorms and high temperatures have spurred green growth so luxuriant that garden paths are now covered in green plants rather than brown mulch and every garden plant is double its normal size. It is a child’s garden for adults, as I look up into the blooms of daylilies and roses above my head and vainly try to temper nature’s enthusiasm for this state of affairs. As a result, I offer here portraits of flowers, bewitching, entrancing, and totally designed to disguise the unruly and weedy carpet at their feet. Any pretense at horticultural control is gone – oh, this is not a polite or nice summer garden – this is unruliness and passion at its best. So, I have narrowed my view, for purposes of this post, to the particular – the particular flower, the particular point of view, the one instead of the many. If I cannot control the garden with snippers and shovel, I will control its perception with the camera lens and what it can reveal through each flower, each leaf, each drop of rain. So many elements conspire to create this cunundrum! This was to be the year of the “total garden” – the wide view of well-defined spaces and elegant combination of elements. “Hah!” said nature and life. “You may wish for control and balance but it is not to be so! Enjoy the wild effusive growth of garden plants and weeds in equal measure and enjoy life to the fullest.” In other words, grow or die. Enjoy this little photo gallery of the particular – the blooms that shine above the chaos of riotous growth and change. I now return to my studio to continue pursuing the choice of particular notes. 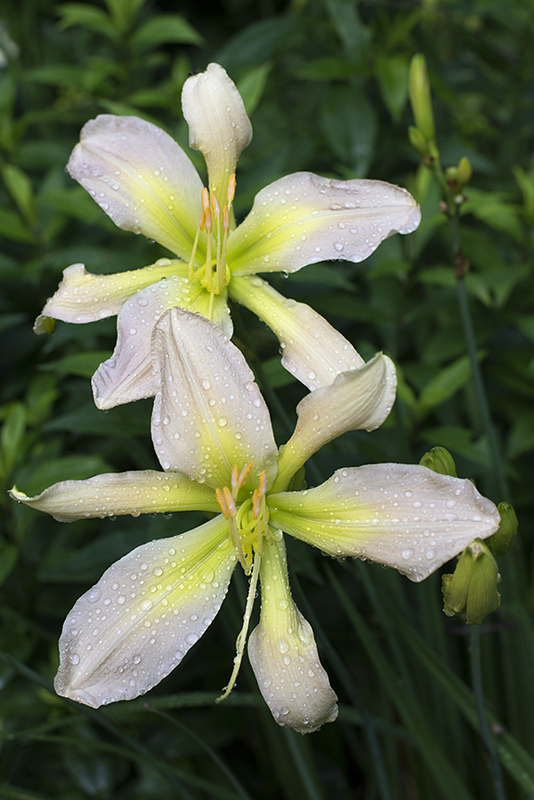 This entry was posted in Garden, Music and tagged choices, composing, daylilies, flower photography, gardening, gardens, quantum choice, quantum physics, rain by composerinthegarden. Bookmark the permalink. Beautiful compositions. Effective use of colour & light. We have been getting unusually heavy rain and more thunder storms with cooler weather here in our part of Ontario. Southern Ontario seems to have acquired a monsoon season. Elmediat, thank you for stopping by and commenting; I’m delighted that you enjoyed the photos. I think we have also acquired a monsoon season in Western Pennsylvania – after a few lovely clear cool days, we are back to moody skies, high temperatures and violent rainstorms. Seems like the predominant weather pattern this season; at least the wet ground allows for weeding all of those “extra plants” (aka weeds) that are emerging. I took a first look at your website and love what I see; looking forward to visiting soon at more length. Lynn, Your flowers are so beautiful, just like your soothing music.Best wishes on your current work! Wonderful flowers, and the drops on them are really a great way to put your wet weather to good use. Thank you, Ehpem. Yes, there is no lack of water drops to photograph this year! oh thank you for sharing such beauty with us. “grow or die”. Grow, I say, grow, amidst all the growth, whether weed or other, allow your beauty to bless all. Wow, Lynn! Just… wow! Your blooms are enchanting and gorgeous. I can relate all too well to this: “Any pretense at horticultural control is gone…” Mother Nature has gone wild this year. I’ve found it to be a lesson in control (or lack thereof). It must be a case of “the good comes with the bad” Paula! I’m still picking those particular notes but the end is in sight – then it is into the garden! You too, Lynn? I feel like my house is Noah’s Ark and we will set launch any day. Everything is growing like crazy but it has rained so much that the flowers are mildewing or rotting before their buds open. It’s nuts! I love your day lilies. Magnificent! It’s going to be 100 degrees next week, so I’m sure I’ll be battling other plant problems. Have a great week. Sorry to hear that you’re getting mildew and rot on your plants, Eleanor 😦 I think the entire eastern US is under a deluge! Last week, we had 3″ of rain in a few hours and parts of the city and southern suburbs were flooded for days. My mother has a 7 foot tomato plant but only a few fruits on it. Now we are in the 90’s too, very hot for us, so I can actually hear the weeds growing while I escape the heat 🙂 A most unusual year, to say the least. Any pretense at horticultural control is gone. I love how you put that. It’s been raining here in southern Virginia fairly steadily since March, washing away last year’s record-setting drought with record-sitting rainfall. Our gardens are overrun with weeds and grass and it’s too wet to cultivate with anything but our hands. Here too, any pretense at horticultural control is gone. Love the photos and the post. Thanks, Bill, glad you enjoyed. I was just out in the garden for a bit today; two days in a row without rain! A good thing, as we had a lot of flooding here a few days ago. At least it isn’t drought, as you pointed out, and I’ve hardly used the hose yet this summer. The good and the bad; at least the plants are loving it! Thank you, Bernie; I enjoyed your images as well! A lovely post Lynn, so many interesting shapes and colours amongst the Day Lillies. Loved the first picture of the bench hidden by those white flowers. Thanks, Chris – I do love the variety of daylillies in the garden. 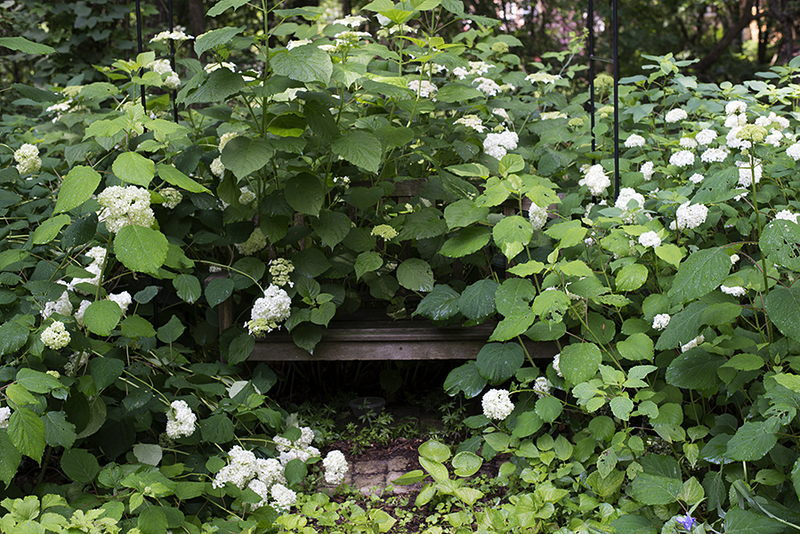 The bench is almost completely hidden by the hydrangea now – they keep getting bigger with all this rain, more to come today! Abundance is the key to the garden this season! Thanks, Elizabeth. I love the “lush and color-drenched” phrase – that’s exactly how I see it as I move through the garden every morning. What a beautiful garden- Ohio has also been uncharacteristically wet the past week and a half. I’m used to it being sunny and clear this time of year! Thanks, Tracy. I think the weather comes straight east from Ohio – the rain seems endless but the garden is enjoying it. At least I don’t have to water anything! I hear you, Lynn. I’m feeling the trees growing closer to our house, so that one day we’ll be swallowed by by them! This must be what it feels like to live in a rainforest! 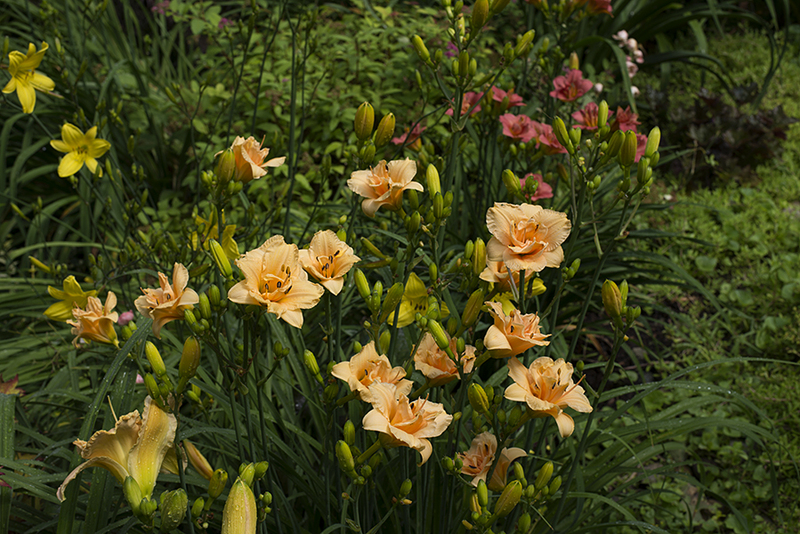 Your daylilies are exceptional – there are so many in your gallery that I am not familiar with but am certainly swooning over. Sheryl, the weeds and flowers are coming hand in hand this year. I’m trying to ignore one and admire the other – it takes selective perception 🙂 As for the daylilies, thank you – I love their colors and they love the heat and rain. They are at peak bloom now; there are over a hundred different daylilies in bloom and it is a glorious sight! Thanks for visiting. Such a beautiful post! I much appreciate your enthusiasm to adore your garden, regardless of how anarchic it insists upon being. Update us on the state of your composition sometime, please! Thank you, Jenny. Yes, anarchy just about describes it 🙂 And yes, I will post about the piece in October once it is premiered; should have a recording of it to share as well. Marvelous!! Looking very forward to it. You have very beautiful day lilies! This summer we have to ‘let go’ of the gardens – resistance is futile 🙂 Good luck with finding ‘that particular one’! Yes, and also ‘ignoring’ some of the weeds – we only have that much time! It is very clever to have so many day lilies and to know their names as well. I am impressed. Thank you, Tootlepedal. I used to collect daylilies; I still have close to 150; about half of them are blooming now, with many more to come. I keep records of them all, hence the remembering of names 🙂 I just added a link at the end of this post to last year’s celebration of daylilies, if you want to see even more! Perhaps your music can borrow from this exhuberant growth – a riot of melodies all trying to gain ascendancy but in the end still forming a cohesive whole? I am the ‘H’-in that I got the H into that word! Hoping we get to hear at least part of the latest in due course. There may much more going on than you planned, Lynn, but–as you’ve aptly demonstrated with the images accompanying this entry–your garden appears to be a closeup shooter’s dream this growing season. It’s great to hear that you’re adapting so well to the latest challenge. I really enjoy your thoughts about gardening and how it relates to music. I bet the big view is pretty cool too though, even with all the out of control growth. I like those spider type day lilies…the way they play with the fatter flowers, their dark colors. Looking forward to hearing more about the composition. Beautiful photos. Thank you, Bluebrightly! I am starting to take a few “big view” photos – it still looks pretty messy to my eye so I may or may not reveal that publicly 🙂 Nevertheless, it is glorious to walk through the waves of color each morning. Spidery dayliies are a favorite of mine, for just the reason that you mentioned. They give an airy grace to the garden, like they are floating above everything. The composition will be premiered in October; I will definitely post a recording of it here. Thanks for stopping by and sharing your thoughts. You make this a nice place to stop by! I just replied to a comment of yours on my blog – don’t know if you check the replies because I know i don’t often get to them – but it relates to this post. I remember when I had an acre or so – a lot of room for messy gardens – and I felt that way too. But now I’m glad for anything that shows the big picture because that brings it all back better. Glorious, Lynn: your garden seems not a cacophony but a choir of orchestral harmony…but yes, after so much rain, it can feel a bit like the magically-growing garden around Sleepy Beauty’s castle. You begin to feel the rumbling of roots underfoot, see the upward, coiling spirals of stem and leaf, and hear the blossoms opening… Your camera’s ability to edit the flowering force reminds me of how, as a child, I listened to “Peter and the Wolf,” and so was taught how to isolate the beauty of each instrument. Thank you for the gorgeous tour. You have such a gift for finding the perfect words as well, and they have contributed to a memorable reflection, once again. May you discover the specific elegance and communal harmonies you likewise seek in your composition. I foresee music as glorious as your garden and words. Yep – the effect of warmth and moisture …. thus a counter to last year’s drought. Dark Star my favorite! I imagine watering time will hit us this month. I love those. the colors compliment each other well. Also purple is my fave color!! Thank you, Amanda; it is a colorful time in the garden!